I find the Economist magazine to be perhaps my single most reliable source of current knowledge. In the June 28th 2014 lead article entitled Creative Destruction, the author speaks to the end of universities in the style to which we have become accustomed. The combination of middle class entitlement, government support, has lead to huge classes, a disappointing dropout rate, rising cost and debt, all in all not a model of sustainability. Add to that, changing technology which has resulted in many the the traditional jobs that university graduates believed they were heading for being replaced with automation. And add to this city crowding has obsoleted the idea that students and faculty and staff should all drive, bus, or bicycle to a bricks and mortar facility in which to learn and teach. The first assault against this old way was the creation of the MOOC (Massive Open On-line Courses), which brings to the computer screen all sorts of lectures from top-notch people either at a very low cost or for free. The problem with MOOCs however is that it is passive and solitary education, no free flow of ideas or discussion. You look at the screen and learn. If it works, good, if it doesn’t, too bad. But there is another approach, which we refer to as VCOLE (Virtual Classroom On-line Education, which takes advantage of the on-line environment, but doesn’t lose the features of classroom education that are so valuable: smaller groups, discussion, debate, peer-to-peer experience. 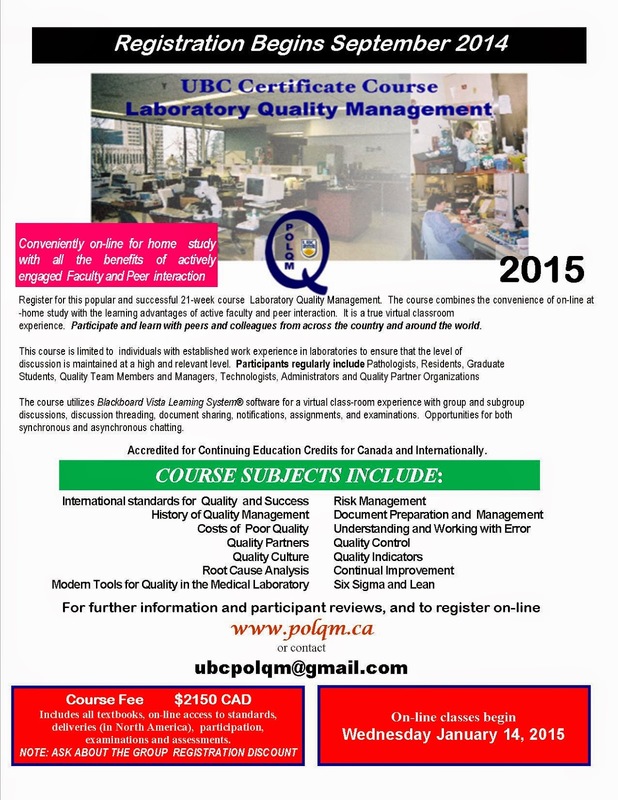 That is the style of our Certificate Course for Laboratory Quality Management, which is about to go into its 2015 season. So far it has proved itself as a successful model. VCOLE is an ideal approach for people who are busy working but are looking for ongoing continuing education either to reinforce their knowledge or to learn new skills, which in our case is all about laboratories and quality improvement. It allows you to learn in your own place and on your own time, but in the virtual company of others. You don't drive to meet them. You meet in a common spot together. The course composition is broadly narrow, broad in the sense that it includes pathologists, clinical scientists, technologists, and some mature students, and broad in the sense that they come from across Canada but also from around the world. But the group is narrow, in the sense they all are people with a lot of laboratory experience (we require at least 5 years), all have a good command of language, and all are committed to getting the most from the course. And importantly we get a lot of participation in dialogue and discussion, which is an essential component for adult learning in both the on-site and the virtual classroom. On average people enter 100-150 comments over the course duration in discussion, with some much much higher. Every group has its talkers and its listeners. But since participation is an essential component of the final grade, one cannot be just a listener. There is a certain consistency to the content, we talk about standards and standards development, and we talk about the tools and skills that people need for quality including risk management and quality indicators, and audits, and root cause. But the information goes through annual review and section re-write and refreshment, and usually additional add-ons. Two years ago we started a module on communication through word-clouds, and word-games and newsletters. This year we will be making a faculty change as well. One of our very knowledgeable and experienced mentors is leaving, to be replaced by someone from a completely different career path, and for me the new person in took this course about seven years ago as a medical resident, and is now the head of a large division, so she has the strength of knowledge, experience and expertise, and the foundations of quality. That is a pretty powerful combination for a course faculty member. In the old days of Canada, we could have a course like this to be held in one centre, and it would serve people of one province. Or if we were in a smaller country we could serve people from all over. But that is not Canada and the way we need to provide new knowledge. Today we need to think broader, but keep in mind that people (at least most people) don’t learn from sitting in their room by themselves looking at a screen. People learn from people. People learn through discussion and debate.